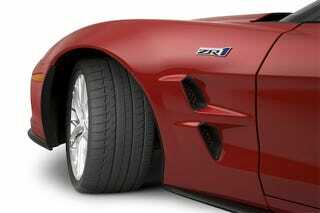 One of the most impressive things about the 2009 Corvette ZR1 is how much grip it has. Normally, sticking 638 HP into something that weighs just 3,350 LBS and driving only the rear wheels would result in massive amounts of wheel spin, both in a straight line and around corners. But in the ZR1, it doesn't — not without significant provocation. This is partly due to the whiz-bang magnetic damping system that adjusts itself near-instantaneously to keep the car level around corners and keep the tires in contact with the road over rough surfaces. But a big part of its grip, and the resulting 7:26.4 ‘Ring time, comes down to the tires: Michelin Pilot Sport PS2 ZPs specially developed, racecar-style, alongside the ZR1. Specific to the ZR1, the 285/30-19 front and 335/25-20 rear tires use a different compound from that of the normal PS2s (which can also be found on the 2009 Cadillac CTS-V), designed to deliver ultimate track performance while retaining the ability to last for 20,000 miles of road use. We're guessing burnouts may reduce their life expectancy substantially. Can the 2009 Cadillac CTS-V Do Burnouts? Unlike earlier versions of run-flat technology, which we weren't big fans of thanks to increased unsprung weight and a harsher ride, these latest Pilot Sports' reinforced sidewalls actually contribute to handling while inflated, helping to transfer braking and cornering loads in a more direct fashion. Additionally, the tires make use of a two-part tread design with large, stable blocks on the outside for maximum grip (the ZR1 can pull 1.05 Gs on the skidpad) and a more grooved tread in the middle for better water dispersion and lower tire noise. The sections are joined by a special "lightning bolt" decoupling channel, which allows each section to movie slightly, independently of the other.